PORTLAND — A high percentage of Maine residential wells reportedly contain levels of naturally occurring arsenic that exceed safety standards set by the state’s Department of Health and Human Services. And even with greater access to a public water supply, nearly 38 percent of homes in Cumberland County still rely on well water, according to data collected by the Maine Center for Disease Control & Prevention. In addition, the Maine CDC said, of the private wells tested in Cumberland County, more than 17 percent have arsenic levels that exceed Maine’s maximum exposure guideline of 10 micrograms per liter. Arsenic has adverse impacts on human health, especially in children, which is why the Environmental Health Strategy Center in Portland is working with the Sadie and Harry Davis Foundation to improve access to safe drinking water. According to the center, arsenic in well water has been linked to a reduction in children’s IQ levels, as well as an increase in the number of bladder cancer cases, among other impacts. Cahueque said the new grant will allow the center to expand a pilot program that connects families with the resources and information they need to have their wells tested and treated. “This funding will also allow us to work with existing community leaders and develop new ones, training them to become health advocates for their friends, families, and neighbors,” he said. “Arsenic occurs naturally in some Maine bedrocks and can leach into wells and contaminate drinking water,” he said. Arsenic is also known to cause bladder, skin and lung cancers and, according to Cahueque, Maine has a bladder cancer rate that’s 20 percent higher than the national average. Along with its education and outreach efforts, Cahueque said the Environmental Health Strategy Center promoted two new state laws last year specifically designed to address the problem of arsenic in well water. One of those new laws provides funding for the installation of water treatment systems for those who cannot otherwise afford it. 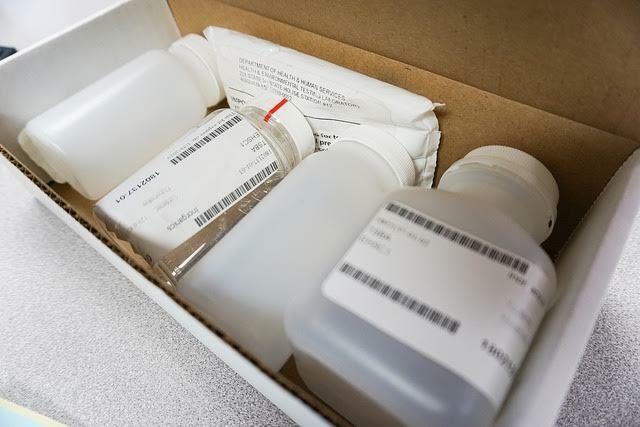 An arsenic test kit of the type used by the Environmental Health Strategy Center of Portland, which is working to improve Mainers’ access to safe drinking water.